"We go where you go...""
Progressive did some shadey crap with my settlement,will see if lawyer can straighten them out. $800K a year for being a TV dip---t.
Geez- glad they made that clear. I was headed down to the pharmacy to get a case of my favorite I'm allergic to that type of medicine. Like the silica gel packs with "don't eat this" on them. Damn, but they look so frikkin tasty. The purpose of television is not to entertain you, but to draw your attention to advertising paid for by sponsors who want to make money. Has been since the beginning. I can't get particularly fired up about a helmet-less Flo. I can't see her influencing anyone to wear a helmet or not. She's just not that cool. However, I agree wholeheartedly with the irritation value of commercials. I DVR everything; haven't listened to Flo (or any other crap) in years. '98 Connie x 2, farkle expenditures nearing the GNP of Bolivia; it's a sickness. I like Flo and my bio-rhythms are much better when TV has commercials. I need time to make snacks & use the toilet. I gave up Progressive insurance when I decided I needed coverage for my body along with my bike. They wouldn't write that kind of policy at the time and I had just heard that some health care coverage was being denied for some bike accidents. They did insure my first bike cheap, though, at the time the only thing I was counting. I always thought that if a company puts that much money into advertising; that's money not going towards customer benefits, claims. Amazing how much money is being spent once you start to count Flo, the lizard, sorry; gecko, your friends at Amica and a few more. And certain states won't allow coverage for the passenger if they are your spouse so that's why I always bring the girlfriend. That's cool if you can get your wife to drive the chase car. I don't think you get it, you won't see helmetless Flo on a TV ad... ain't gonna happen, because Progressive is just smart enough not to broadcast it to general population..
2 other ads in the past year have similar themes, one has her in a precarious position reflected on a shiny traler adjacent, on a freeway, and one has her reflected off a puddle on a cobblestone road, hanging of the side of the bike.... all in all, these are just feeding them. I saw that ad and thought the same thing - didn't really promote safe motorcycling. 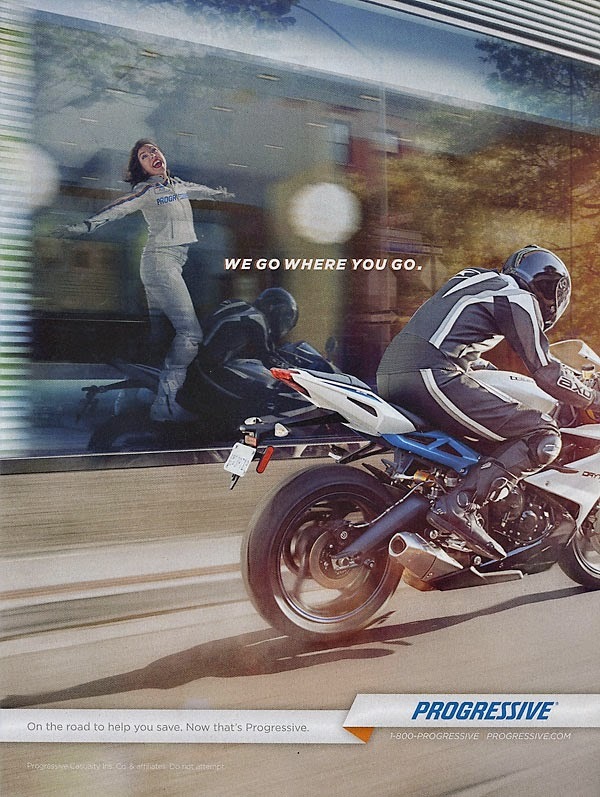 Not to mention the rider of the sport bike in the ad was in the tuck position and they made it appear that they were travelling at a high rate of speed. The only thing missing was the front wheel in the air! I would expect something a little tamer from an insurance company. You guys! They aren't promoting safe motorcycling; they are promoting the sale of motorcycle insurance. It's to get attention, which it did. Check out YouTube fail compilations. Flo's ad antics aren't influencing youth stupidity and ignorance one bit. Get over yourselves. Or start writing letters. and yes, they are promoting insurance, and showing something totally ridiculous... so if someone dies, is injured, etc... do you think they will cover it? Meh, they will just say "it was an ad, we don't condone it...."
On my list of things to be worried or concerned with, the Flo ads are way off the bottom. I couldn't care less whether or not she wears a helmet, too close to a PC thing. I find this whole conversation just plain silly! Ok, I'm looping at the April 2015 issue because when I cleaned off my desk recently I didn't go that deep, and on page 13 there's the overhead shot of the cruiser on cobblestones, rear wheel in a puddle for the reflection, helmetless Flo in the puddle but obviously not on the passenger seat. Based on the wake in the puddle he's doing a good 5 mph. The speedo says 15, ok, traction issue but no water spinning off the tire? With his handlebars cocked to the right he better be planning a sharp left turn or things are going to go bad. But maybe he's doing a wheelie? Helmetless Flo seems to have caused torso-less rider, too, unless he's got his face ... um, never mind. Anyway I think it's supposed to remind you of the "walking with Jesus" story although since I heard a preacher at a friend's funeral saying he'd been walking with Jesus a lot before he died the phrase has taken on new meaning for me. For now I think if you've been "Riding with Flo" you might need to dial it back a little. There are some chicks on YouTube who can pull off that stunt quite well, with and without helmets. I saw one where a guy had one behind and one in front facing him, he's riding wheelie for a long way, and they are playing bucking bronco, hamming it up for the camera following them. I guarantee you they never saw your ad. Yes... really. It's a non-issue. What about Allstate's Mayhem, or the AFLAC duck, or Farmers? Ads, both print and TV, are meant to be sensational to get your attention. Flo is tame compared to some. And this IS silly. Now that I've seen the picture... This really is a tempest in a teacup. It's a reflection; she's supposed to be like your guardian angel. The real guy is riding in full ATGATT, by himself. He passes a window, and you see that Flo (meaning Progressive) is always with you. Perhaps she's perched on the back instead of flying because she's not fast enough. I know my guardian angel is plenty fast; she has always kept up with me. Old news. Peter Lewis, the son of the company co-founder, was the CEO of Progressive from 1965 to 2000, and after that date was no longer an executive with the company or had any involvement with the day-to-day operations. His various associations and donations that you object to were made after that date. While he was CEO, he donated $50mil to the Guggenheim Museum. But that was his money, not the company's. Maybe you don't like the Guggenheim? If you don't like Progressive, I suggest you find a new reason. I thought her dad was the Arai HELMET founder. It was Flo's drunk uncle that coined the phrase..."Hold my beer and watch this." Then again, the guy is wearing a helmet. Saw the ad a week or so back, and thought.... "what a bunch of morons.... let's do stupid crap, film it on our new phone, and post it on the web.... and then, use it in a dumbmercial...on tv....."